Continue interplanting pine, etc. within Walnut rows on the 'top 40' acres. Started w/ red pine. 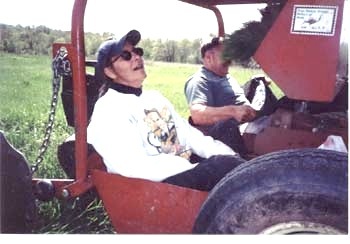 We began planting at top of hill; at south end of the top land (60 acres) with rows going north/south and extending all the way to north end of property. The first row was just west of walnut row #52- & moved towards west. We ran our new rows between every row of Walnut. Jordan walked ahead & flagged Walnut tress to mark rows. The planting crew after finishing for the day. 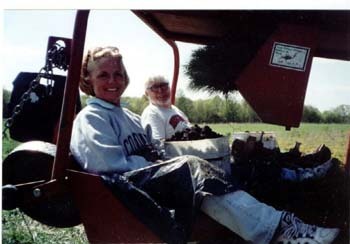 Tree planters standing in front of 'big red' planting machine. Richard, Roland, Debi, Me, Win, & Kelly. Jordan is taking the picture (or is that him in the middle?). Richard lending scale to the area planted. This picture shows where we started planting this year ( just west of walnut row #52). This is looking south from the north end of the farm. This first (eastern most) row lines up with the north/west corner of the 'spruce patch'. We planted from here going west. We planted a row between every Walnut row (remember that the walnuts were seeded in rows seperated by two corn rows) We didn't skip every other row like we did last year. This area has a triangular shape because it abuts the strips to the west. Therefore, each row got slightly shorter to the north as we proceded west. Same tree row in 2012. He is standing next to one of the Black Walnut trees that we seeded in between the corn rows. It is nearly as tall as he is - half as tall as the pine. These walnuts have taken a long time to get going but once they get above the deer browse (then sneak past) they really take off. I will soon be faced with a decision here as to which tree I let grow; the walnut of the pine. I wonder which I will choose. Jordan - my trusted guide. Jordan was photographer in the other picture of the crew. He drove tractor last year but this was a bigger tractor and this year he resisted. 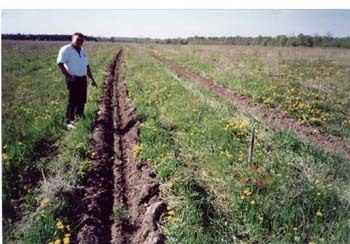 His main job was to walk in front of the planter and mark the rows of walnuts so that I could follow between. These trees were only 2 years from seed and since it was spring - before bud break - they were mearly sticks difficult to imposible to see from the tractor seat. This year we had the planter named "Big Red". After our poor luck last year with the small planter we specifically asked for something better. This planter also has a scalper (a blow that clears furrow in the sod ahead of the planting knife) but there is more weight to this unit so the furrow is more consistent in the dense sod on this rich soil. Here you see the layout of this planter. 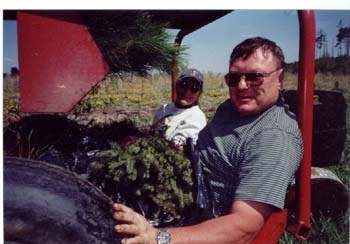 Two people sit on either side of the furrow and alternate laying the tree in the trench. The transplants are stored in trays located above their legs. Tthis means if the transplants have wet roots - which they should - the planters' legs will get a bit wet. A good idea is to have rain pants. We didn't know this. The two wheels behind the seats close the trench and pack the soil around the newly planted tree's roots. This is something the small planter (from last year) did not have. 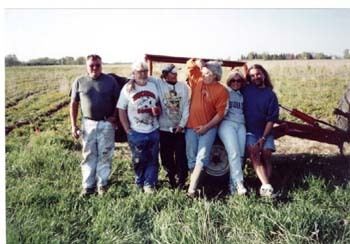 The crew took turns at planting during the day. This planter has the people facing forward - as opposed to the green planter we used the first year which had the people facing the rear. All in all this is a much more civilized planter. There is a bell connected to one of the press wheels. This bell dings every 6 feet or so. This is to help the planters gage when they should be placing a seedling into the trench. As you can see, it is a warm day so getting a little wet is only a little uncomfortable (mainly because it's muddy-wet). You may have noticed the bucket of black walnuts sitting between the two planters in the above pictures. 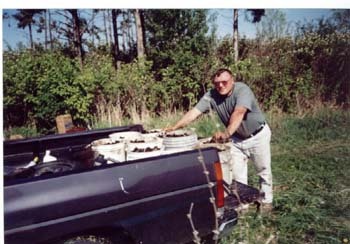 Roland brought a truckload of nuts from his garden in River Falls. These were placed in pits last fall and covered with screen - to keep the squirrels out - where they got their cold treatment in order to sprout this spring. You will recall that this is the same process we used to plant 70,000(plus) Walnuts during the winter of 1997-98. As we proceded down the row the planters would grab couple walnuts from this bucket and drop them in the trench between the transplants (in their 'spare' time). 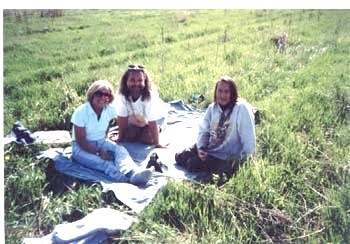 Without such a great group of volunteers like this we would never have been able to plant this land into trees. We learned this last year when we had so many trees to plant the second day with just the four of us. 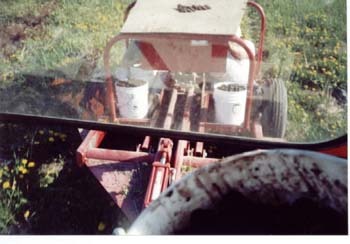 The view from the tractor cab - looking back at the planter. I couldn't see the people planting and they had to shout and wave if they needed my attention. We stashed buckets of walnuts everywhere there was a spare space. We planted 20 rows today. These rows averaged over 1/3 of a mile in total. So today we planted about 7 miles of tree row. Planting gets to be a long day and, at some point, everyone asks; "Are we done yet?" This day we planted 4000 evergreen transplants from the DNR nursery as well as a couple thousand walnut seeds and over 800 Red Oak transplants from our own 'nursery'. Not a bad day's work. Thank you all !!! I'm searching my archives for the original copies of these pictures so that you will be able to click on these thumnail images to see the larger copy. I will post these as soon as I find them. Roland & I planted out Red Oak Small trees (fm brick bed) planted in back headland. Beginning @ row 24 plant trees beginning @ stake & planting towards fence (6-7 trees / row. Roland startsd planting 2 per hole - of the smaller of the trees. Large trees (fm wood frame) on top of hill. [[ this is at the south end of the main planting and, once again, in the original corn headlands ]] - 2 rows west to east beginning @ orchard. - S. Row lined up on apple row going to road. 2d row parallel to this and 20 ft to the north. 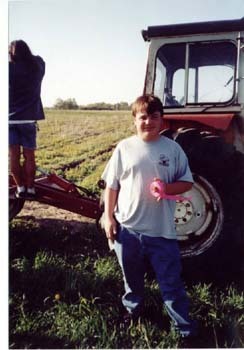 May 5th, 2001 Spray Simizine as pre-emergent herbicide on all acres planted this spring. This spraying was delayed by inclement weather and field conditions that were too wet for the spray rig (a pickup with mounted sprayer). With simizine, it depends on what percentage of the grasses have come up. If less than 20-25 % have come up, no problem. If more, we should try something else. How do you gauge it? It's very subjective. Based on cover from last year, and what poking through, etc. At this point I would still use simizine, sight unseen, based on other fields I have seen, but maybe at a higher rate, say 3-31/2 qts per acre. Other option, wait till grass is 8-10 inches high, and use fusilade. Timing is critical, and I don't have a lot of experience with this one. On May 5th the spray applicator called to say he could now enter the fields so we decided to go ahead and spray. Stuart, I haven't been very good at keeping you posted about your trees. I stop there probably once a week. I think that herbicide is helping, though that ground is so good that the weeds grow anyway. I was walking that bottom land and I found very few trees in there. 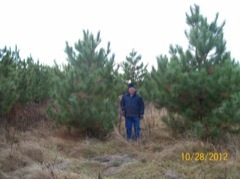 The pine do poorly in that rich soil and wet conditions. Some very nice red oak. What are some trees that can handle that low ground? My thought would be black ash. Hard maple? I will try to plant some tall black ash this spring yet from my woods and see what happens. The top is getting a slow start in this cold. The pine can take the cold and are growing. The red oak can handle cold also. The rest of that top is getting off to a slow start. The prairie doesn't yeild to forest without a fight. We just haven't had warm weather. It is 65 deg. in the house now and I have a small fire in the furnace. Some thoughts from Roland on what to do with blow-down in windbreak. It's just too labor intensive to try to peel logs. Then they split in toward the center as they dry. As an idea, we maybe could get a band saw and just saw a big pile of lumber and stack it in the shed or barn. One can saw 6x6 and make wonderful buildings out of them. They are quiet, well insulated. You put 1x4 between the timbers and fill that inch on each side with an insulating material. The saw on the low end, you pull the saw down the log, for about four thousand. I would go in on it with you. Besides that, I wouldn't get too concerned about leaving the stuff flat on the ground. The pine has little value on the market. And the bugs won't get out of hand unless it is a brutal, dry summer. The living trees can fight the bugs unless they are very stressed. They don't winter well, so next year the bugs won't be a problem. And I am concerned about using much round up. one can do a lot of damage to the good seedlings. Maybe just cutting the elder will set it back enough. I think August cutting would kill it. Please take the box elder also, it will just seed in more of your CRP land. The red oak, maple, and oak are the best choices, the rest could go also. Anytime you are cutting and/or selling something other than firewood for your own use and the land is in the Forest Tax Law program, you must file a cutting notice. I will send you one. Once you are done or have sold the wood, you report the volume cut on the same form. In hard hit plantations where there is less than 30 sq. ft of Basal area left. And the landowner wanted to replant, I would suggest cutting everything and starting over with clearing or disc trenching and planting. The new growth doesn't matter cause your starting over. IF the landowner did not want to replant to pine and let the hardwoods go, I would still suggest cutting most of the pine, because of the future wind damage potential. If you have above 60 sq ft. of basal area left, you can clean up the damaged stuff, and again so what about the new growth. You will be growing the existing pine for another 60-80 years and you don't need advanced regeneration yet. Your argument about future winds has some truth to it. and that's where the 30-60 sq. ft. question comes in. The stand is susceptible to wind until the trees gain enough diameter to hold themselves up instead of relying on neighbors. I guess you take your hat in your hand and make a decision. Yes, the application to get in for 2003 is January 31st. We're collecting nuts here in Madison -- as in tree "nuts" (all the other nuts just seem to congregate here). The Burr oaks were full of acorns and are pretty much done falling. I was able to fill a grocery bag -- ahead of the squirrels. Debi and I walked the parks last night and found red oaks and white oaks of all different sizes and shapes. The acorns were just covering the ground. But we forgot our mosquito repellent so we only managed a bag and a half (and dozens of welts). We will go back. There is a big shag bark hickory in the park and the nuts are ready to drop. Of course the squirrels are getting them in the tree and the ground is littered with hulls. Debi and I got about a half bag by shaking the limbs that we could reach (and covering our heads). Two years ago the ground was covered with nuts from this tree but they seemed smaller then -- and it seemed like the squirrels hadn't found them yet. We are still waiting for the hard maple and the walnut, etc. I'm thinking it would be nice to get some plums and apples to put into the mix. This is a hint to all of you to collect as many nuts as you can find. Any that you don't need would be appreciated for spreading at the farm.